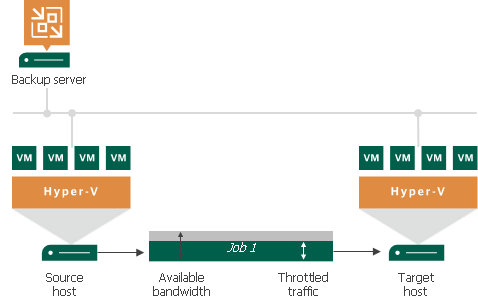 To limit the impact of Veeam Backup & Replication tasks on network performance, you can throttle network traffic for jobs. Network traffic throttling prevents jobs from utilizing the entire bandwidth available in your environment and makes sure that enough traffic is provided for other network operations. It is especially recommended that you throttle network traffic if you perform offsite backup or replicate VMs to a DR site over slow WAN links. Network traffic throttling is implemented through rules. Network throttling rules apply to components in the Veeam backup infrastructure, so you do not have to make any changes to the network infrastructure. Rules are set for a pair of IP address ranges and are applied to the source and target components between which data is transferred over the network. The range can include a single IP address. When a new job starts, Veeam Backup & Replication checks network traffic throttling rules against a pair of components assigned for the job. If the source and target IP addresses fall into specified IP ranges, the rule is applied. For example, if for a network traffic throttling rule you specify 192.168.0.1 – 192.168.0.255 as the source range and 172.16.0.1 – 172.16.0.255 as the target range, and the source component has IP address 192.168.0.12, while the target component has IP address 172.16.0.31, the rule will be applied. The network traffic going from source to target will be throttled. Throttling rules are reversible — they function in two directions. If the IP address of the component on the source side falls into the target IP range, and the IP address of the component on the target side falls into the source IP range, the rule will be applied in any case. 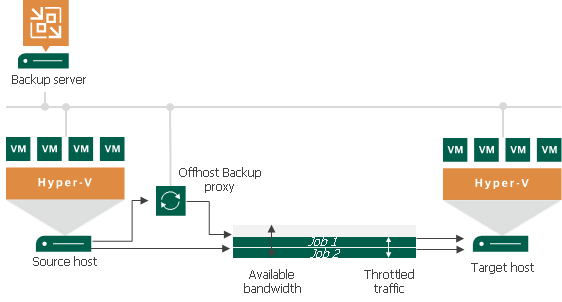 Veeam Backup & Replication equally splits available bandwidth between all jobs that use backup infrastructure components to which a network throttling rule applies. For example, if you run one job that uses a pair of backup infrastructure components to which the rule applies, the job will get the entire bandwidth allowed by the rule. If you run two jobs at a time, the allowed bandwidth will be equally split between them. As soon as one of the jobs completes, the bandwidth assigned to it will be freed, and the remaining job will use the entire bandwidth allowed by the rule. Throttling rules can be scheduled to only be active during specific time intervals (for example, during business hours). This way, you can minimize the impact of job performance spikes on the production network. Alternatively, you can select to apply throttling rules regardless of the time. Rule 1 limits the speed to 1 Mbps Monday through Friday from 7 AM to 7 PM. Rule 2 limits the speed to 10 Mbps on weekends and from 7 PM to 7 AM on weekdays. In this case, Veeam Backup & Replication will limit the data transfer speed to 1 Mbps during business hours, while during non-business hours the speed will be limited to 10 Mbps. Veeam Backup & Replication will use the lowest transfer speed for backup infrastructure components that fall into the source and target IP ranges — that is, a 1 Mbps rule. From the main menu, select Network Traffic Rules. In the Source IP address range section, specify a range of IP addresses for backup infrastructure components on the source side. In the Target IP address range section, specify a range of IP addresses for backup infrastructure components on the target side. 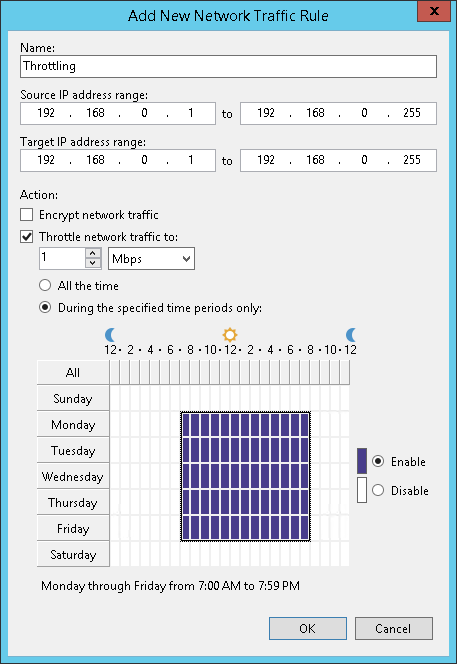 Select the Throttle network traffic check box. In the Throttle to field, specify the maximum speed that must be used to transfer VM data from source to target. In the Apply throttling section, specify the time interval during which the rule must be enforced. You can select to use throttling rules all the time or schedule traffic throttling at specific time intervals, for example, during business hours to minimize the impact of data protection activities on the production network. You can view which network traffic throttling rules apply to an off-host backup proxy at the Traffic step of the backup proxy wizard.